Permeable pavers, also known as pervious pavers, are flat blocks that allow water to drain directly into the ground. They are ideal for any form of eco-friendly landscaping for this reason. Capturing rainwater before it runs into the streets reduces the likelihood of flooding. Also, keeping rain water, which carries many pollutants, from reaching storm sewers reduces the amount of contaminated water that enters the water supply. Pervious pavers are quite strong. They can support a tremendous amount of weight, which is why they are often used in commercial construction. In the domain of residential landscaping, they are most often used to build driveways, patios in sensitive areas, patios near vegetation, and hardscapes connected to retaining walls built for land retention purposes. While details of designs vary widely, the fundamental design of permeable pavers is remarkably simply. A grid of some sort creates the basic frame for the design. Within the gird, a variety of porous materials is introduced that will filter rainwater directly from the hardscape surface directly into the ground. The porous material can be organic in nature, or it can consist of pebbles, decorative gravel, larger rocks, sand, or mulch. 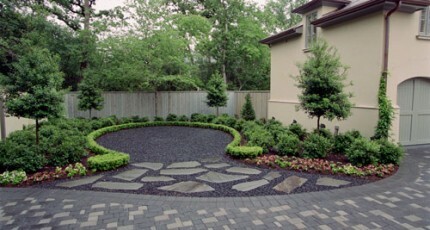 Most organic hardscapes, if you want to call them that, use grass as the primary vegetation within the paver grid. In most landscaping plans, concrete is used to form a large grid pattern, and grass is introduced into the spaces between the concrete. In some modern landscapes and contemporary garden designs, grass pavers are created using black plastic grid patterns that present a stark contrast to the vegetation they house. It goes without saying that concrete permeable pavers are far more common. Concrete can be molded into any desired shape. It can also be stained or mixed with gravel to create an ornamental aggregate design. Concrete is also equally complimented by vegetation, rock, or sand. By building hardscapes out of interlocking pervious pavers made from concrete, we can build any type of patio, sidewalk, or pathway that will compliment both home and property curb appeal. One of the most practical applications for permeable pavers in Houston landscaping is found in the construction of driveways and motor courts. Solid surfaces this large will create a great deal of water runoff in front yards and the streets beyond. However, when we build these structures using a pervious substance, we eliminate this runoff and minimize the risk of flooding the yard or the street in front of the home. Pervious materials are equally suitable for the construction of patios and walkways near sensitive vegetation. Tree preservation is one of our highest priorities in Houston landscaping, and patios built directly above tree roots often must be made of pervious materials in order to allow water to reach the roots. An interlocking design also distributes weight more evenly across its surface and reduces the amount of force pressing directly down on the tree roots. Permeable pavers are also great for garden patios and walkways because they help water plants. So effective are they in the filtration of water that we often do not have to install irrigation or drainage systems into plantings of vegetation. Gardens look more natural, and installation costs are reduced by eliminating the needs to build costly, concealed water transfer mechanisms. In a climate as wet as that of Southeast Texas, Houston homes that reside near any of the larger bayous can also benefit greatly from the use of pervious hardscape design. Because these pavers siphon water straight into the ground, they exponentially reduce the force of erosion. A soggy area in the back of a yard can be transformed into a large, grass-filled permeable paver patio area decorated with moss covered rocks that stabilize and retain the soil. Retaining walls built overlooking the bayou can be ornamented with interlocking concrete paver patios interfilled with colorful gravel that filters the water back into the artificial hill and water the plants that grow along its terraced surface areas. These are just a few examples of how we can integrate grass pavers, concrete porous pavers, and interlocking concrete pavers into any number of Houston landscaping design styles. Permeable paver hardscapes are good for the environment and enhance property curb appeal with structures that are both aesthetic and functional at once. Less expensive permeable driveway pavers can be solid pavers that are spaced in such a way as to allow water to drain between them. These are made from stone, concrete, brick, or decorative concrete. Others are made from concrete that is actually porous. These pavers allow water to drain through their entire surface. Both offer environmentally friendly benefits, with porous pavers of course being the more effective of the two.